Wine and school: Two things I always thought should go together. Jefferson Community College in Watertown, NY has an eye to increasing interest in New York State wines and educating future wine entrepreneurs by offering winery management and marketing courses starting inÂ the Fall 2012 semester. Northern New York Fox News Affiliate 28 reports that the college hopes to eventually offer a certificate program and a degree program concentration in winemaking and winery management. JCC is also planning on planting grape vines on campus so that they may bottle their own wine someday. According to a February 27 job posting on the Inside Higher Ed website, JCC is looking for a full-time, tenure-track instructor to teach Winery Management & MarketingÂ for theÂ school’s hospitality and tourism program. 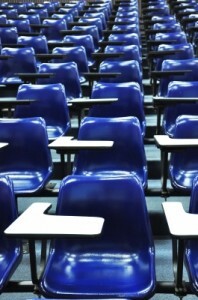 The class is expected to start in August 2012. The job post notes that the school is looking for someone to teach two to three courses during the Fall semester and promote the Winery Management & Marketing degree for the school. Other statesÂ with well-established wine regions have colleges and universities with wine education programs. Washington State University has a viticulture and enology undergraduate degree program that trains students to produce wine and prepare for careers in the industry. It also offers graduate degree and certificate programs. Napa Valley College in California has a winery located on its campus which is part of the school’s Winery Technology program. California’s Sonoma State University offers a B.S. in Business Administration with a concentration in Wine Business Strategies. The University of California, Davis, shows that winemaking is for the super smarties — the school’s Department of Viticulture and Enology has bachelors and masters degrees that focus on the chemistry, plant physiology, engineering and microbiology involved in growing grapes and producing perfect wines. wow, how can you not mention California State University Fresno?! in 1997 Fresno State became the first university in the country to have a winery fully licensed to produce, bottle and sell wine. they have an amazing program there. I don’t know how I managed to leave Fresno out! Thanks so much for reminding me because that is a big deal! I was trying to show a variety of different educational programs — some focused on the marketing and business end and some on the production end.